We have created a page with links to the most important collections of digitized Church Slavonic manuscripts and old prints. These can be found here or on the Resources tab. If you miss any link on the list, please let us know (we are not now referring to a specific manuscript, but to a collection, especially a digital library of an institution containing (Old) Church Slavonic manuscript both in Cyrillic and Glagolitic scripts). Paleoslavistic Conference "Naked are nations without books"
We invite you to the Paleoslavistic Conference "Naked are nations without books" held during the days 28th February to 1st March 2019 in the Academic Conference Centre in Prague, Husova 4a. 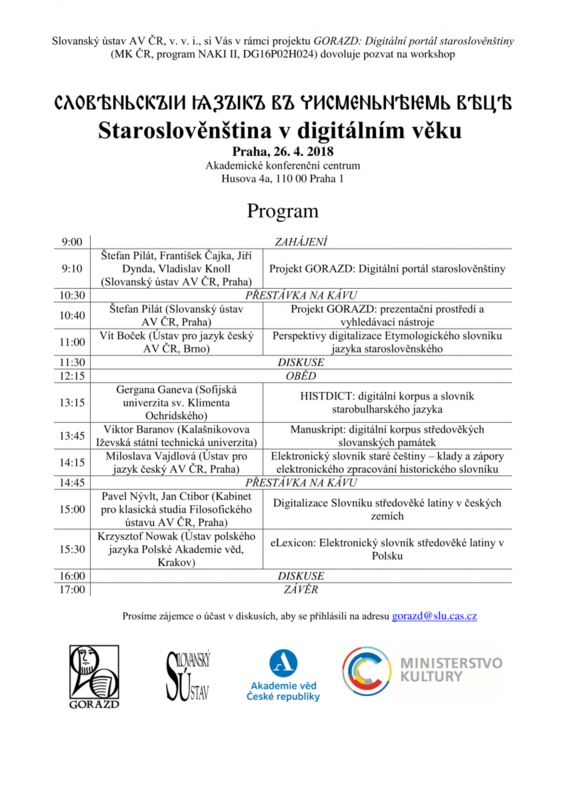 Preliminary Programme of the Workshop "Old Church Slavonic in the Digital Age"
An information booklet about the GORAZD Project has just been published in the edition Science Around us. The booklet was prepared by the members of the implementation team F. Čajka, M. Chromá, V. Knoll, Š. Pilát and K. Spurná. In the booklet you can find information about the project and its goals and the software solution, you can also learn about dictionaries incorporated in the project, their brief history and the way of their digitalization as well as the plans and possibilities for future development and expansion. On the booklet cover you can also find basic information about the Institute of Slavonic Studies of the Academy of Science of the Czech Republic, v. v. i., its sometimes difficult history and current activities and projects. You can obtain the booklet for free in the library of the Institute of Slavonic Studies or it is available for free download here. The booklet is also available in Czech and Russian versions. Within the GORAZD Project, we have created and published a new web application that facilitates the automatic conversion of both Glagolitic and Cyrillic numeral signs into Arabic numerals and viceversa. Besides this, also the Old Church Slavonic numerals’ names are displayed. In the Glagolitic script, the displayable numeral values are until 5,999, in Cyrillic up to 9,999,999,999. The application is available under the licence of Creative Commons BY-NC 3.0. The application was created by Martin Rybenský and Štefan Pilát, assistance on the English translation was provided by Vladislav Knoll.